They expected the country's military to support their plot. They thought regional leaders would go along with forcibly topping Maduro militarily. Reality on the ground is polar opposite establishment media propaganda, Gignoux and Graterol explained, saying they observed "lack of poverty" as portrayed by Western media, lack of homelessness, lack of public desperation. "Nobody is dying from hunger or malnutrition," they said. They're relying on a vegetarian diet. It's more health-promoting than what most Americans eat. I thrived on it for decades. "Everyone is receiving help from the government…People are still smiling and making jokes about the situation. (They're) willing to share," the journalists explained. "During blackouts, people told stories, played music, or went out and talked on the streets. It was a paradise, no TVs, smartphones, but real human contact. People cook together. During the day they're playing board games, dominoes, and kids are having fun." Sanctions indeed took their toll, their effect on ordinary Venezuelans not what's claimed by Western media. Most Venezuelans blame the US for the country's troubled economy. "There's not chaos" the Trump regime expected. Guaido stays in luxury La Mercedes hotel accommodations. He's "the most hated guy in Venezuela" - a pathetic figure with no legitimacy, the journalists stressed. The NYT lying machine is Exhibit A of what Western media propaganda is all about, saying: "(I)n the last three years (Venezuela's) economy has collapsed" - a bald-faced Big Lie. It way down but far from out. Not a word from the Times about the toll from US sanctions war, flagrantly violating international and constitutional law. The Times: "Hunger has gripped the nation for years. Now, it's killing children…Doctors are seeing record numbers of children with severe malnutrition. Hundreds have died" - more bald-faced Big Lies. The Times: "(A)ngry crowds (are) ransacking grocery stores (D)eaths from malnutrition have remained a closely guarded secret by the Venezuelan government" - more rubbish. The Times: "For many low-income families, the crisis has completely redrawn the social landscape. Parents go days without eating, shriveling to the weight of children themselves." "Women line up at sterilization clinics to avoid having children they can't feed. Young boys leave home and join street gangs to scavenge for scraps, their bodies bearing the scars of knife fights with competitors." "Crowds of adults storm dumpsters after restaurants close. Babies die because it is hard to find or afford infant formula, even in emergency rooms." NYT: "Venezuela President Maduro Used Cuban International Medical Corps For Political Manipulation"
Washington Post: Venezuelans find ways to cope with inflation and hunger"
Washington Post: "Venezuela is truly on the verge of collapse"
Wall Street Journal: "Maduro Loses Grip on Venezuela's Poor, a Vital Source of His Power"
Fox News: "Polish journalist in Venezuela tormented, viciously beaten by government death squad." Reuters: "Watching my nation implode: A Venezuelan photographer's story"
Al Jazeera: "US sanctions hurting Venezuela's most vulnerable"
London Guardian: "The fallen metropolis: the collapse of Caracas, the jewel of Latin America"
All of the above sounds like it's straight from Joseph Goebbel's playbook. The NYT and other Western media are a collective lying machine - serving as press agents for Washington's imperial agenda. They long ago abandoned what journalism is supposed to be. What's ahead for Venezuela? Trump regime hardliners are desperate. Short of direct military intervention, their coup plot failed. 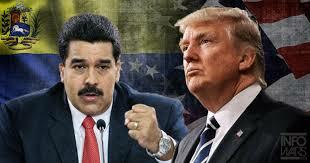 On Tuesday, DLT claimed he hasn't yet imposed what he called "the toughest sanctions," a further attempt to block Venezuelan revenues by imposing "secondary sanctions" on nations, entities and individuals continuing normal relations with the Bolivarian Republic. "We can go a lot tougher if we need to do that," he roared. He repeated what increasingly sounds empty, saying "(a)ll options are on the table" - meaning military intervention Venezuelans and nearly the entire world community opposes, notably virtually all regional ruling authorities. The same goes for "low intensity conflicts – the penetration into the sovereign territory of Venezuela from abroad by elements that could be described as paramilitaries to stage provocations and in other ways interfere in the affairs of this state." "(T)he US wasn't able to understand why Russia insists that the legitimate president of Venezuela, Nicolas Maduro, should be respected…"
Ryabkov should have warned Abrams, saying if the Trump regime intervenes against Venezuela by direct or proxy military force, Russia will defend its sovereignty - similar to how it's combatting US-supported terrorists in Syria. Venezuela is a good neighbor, democratically governed, threatening no other countries. It's a valued Russian ally. It's time Putin stepped up to the plate and did the right thing. Sending a protective peacekeeping force to the Bolivarian Republic is my favored option. With Russian forces on the ground, Trump regime hardliners aren't likely to risk harming them by direct or proxy military intervention. Kremlin peacekeepers can defeat the Trump regime's coup plot - putting the final nail in the scheme, preserving Venezuelan social democracy, the region's best.